For the last several years the sport of fly-fishing has been threatened by decline, primarily attributed to young kids not taking up their parent’s and grandparent’s most soothing activity. As more experienced anglers, we try to engage young kids in the sport in the best way we can; last year Cameron Mortenson (from the Fiberglass Manifesto) and Kevin Powell started the website FishyKid.org, which has attracted many kids (and probably parents too) and is successfully keeping kids interested in the sport. Tenkara USA also sees itself as a great conduit to get kids involved in the sport, with “cool” telescopic rods, that are longer than their parents yet very lightweight, very sensitive and, importantly, easy to use. Our rods are being very widely adopted by parents wanting to teach their kids how to fly-fish, and from several reports, it is working well. To a certain degree tenkara changes the game by making it easier, and most importantly, less frustrating for kids to take up the activity. Give a kid a tenkara rod, and he will quickly figure out how to cast it, and most often quickly catch a fish too, thus “hooking” him for life. Of course, there is always the “Tsuri kiji Sanpei” comics to get their interest too. 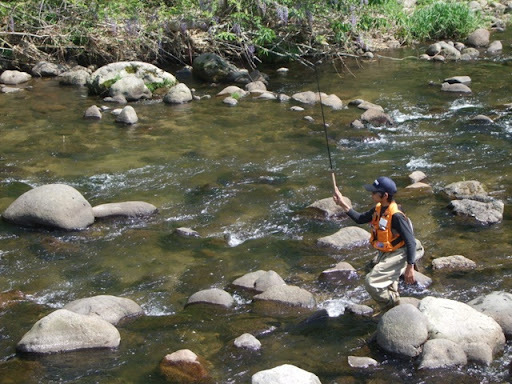 It was with great relief that, while visiting Japan, we’d find a living proof that the young are still taking up the sport, at least via tenkara. During the tenkara event we got to meet young Taiga Watanabe, who was just about to turn 13. Taiga goes by the nickname “Tenkara Ouji”, translated as “tenkara prince”, and is well known for hanging out with the older “Tenkara Oyaji”, secretly picking up the masters’ tricks. Tenkara Ouji showed us a tray filled with multiple tenkara patterns he tied himself, and which he sold like candy to anglers in the event. In an effort to foster his keen interest in tenkara, or perhaps to feed his insatiable appetite for cool tenkara gear, I put in an order for a few dozen tenkara flies. I knew anglers here would love to have them. His dad assured me Taiga would be tying flies through the summer anyways, so he may as well sell them to me so he could sustain his tenkara addiction. We shook hands and a few weeks later we received these beautiful flies. I kept a few for myself, and have caught plenty of fish on them. The rest are now available for purchase as sets, which include one of each of the flies pictured below. These flies wont’ last long, only a small number of sets is available. 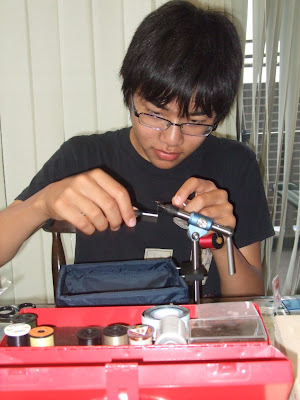 He’s currently tying new patterns for us, which should be available in a couple of weeks. Always encouraging to see young people get into fishing. His flies look great, too. I have been teaching my 7 year old how to fly fish via Tenkara. I remember the frustration of learning to cast a bamboo tod at his age. The Tenkara with a Chernobyl ant at the local pond has relieved him of experiencing the frustration. I received my set of flies tied by the young man yesterday. I’m very impressed with the quality of the flies and look forward to using them on my next trip. We’re heading to the King’s Canyon National Park for 3 or 4 days of camping. Look out trout of the King’s Canyon, Tenkara Ouji flies are coming!